In Zola Predosa, Palazzo Albergati there is an elegant 17th century villa, commissioned by Girolamo Albergati, Bolognese ambassador in Rome and doyen of the Bolognese Senate. The simplicity and compactness of the façade is misleading, hiding the splendour of the interiors, which make it one of the best examples of Baroque architecture in Italy. The architect Gian Giacomo Monti, already active at the courts of Modena and Mantua, created the arch at the beginning of the portico of San Luca in Bologna. Particularly beautiful is the central hall, with its 30-metre-high ceiling. The gallery of the hall was used in the 18th century by Francesco Albergati as a theatre for performances of his own works, as well as works by Voltaire and Goldoni. The villa was visited by many important figures of European politics and culture, among whom Frederick IV of Denmark, James III of England and Scotland, the Queen of Poland, Giacomo Casanova, as well as both Goldoni himself and Alfieri. A curious note: the staircases are notably bizarre, being helicoidal, spiral, double-spiral, and with asymmetrical steps. The garden-park around the villa reflects the ditches and canals of the surrounding plains and reveals the double function of the building - at one and the same time a holiday home and the administrative centre for its lands. The palazzo is an ideal location for various events, including meetings, exhibitions, fairs, exhibition shows, gala evenings and performances. 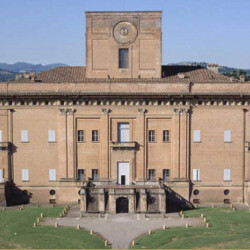 The palazzo also hosts cultural and musical events, including "Corti, Chiese e Cortili", folk and sacred music concerts. The Palazzo can be visited by previous booking.